After more than 20 years’ experience working in the banking industry, Susan Stephens is excited about combining her strong financial acumen and traditional Māori values to help those in her community achieve their own home ownership dreams. Susan’s career began as a batching clerk at ANZ in 1988 and she quickly moved up the ranks to an Assistant Business Manager Role. 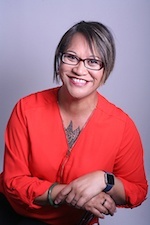 Through her own hard work and perseverance, Susan was named the National Business Manager for the National Kohanga Reo Trust and represented ANZ in a Māori television programme about financial literacy and home ownership. Her strong values play an integral part in how Susan conducts her own business, and she is committed to supporting her whanau, hapu and iwi. Whaanau Ora: I believe that family success starts at home, and that includes the wider family community. For many, the self-empowerment journey begins when going through the process of thinking about and then purchasing a first home. Whakapapa: My great grandmother is the perfect example of success and strong leadership. In the early 1940’s, as a widowed, middle-aged, solo-parent, Māori woman – she bought a large piece of land in the heart of the Kiingitanga for £35. She created a home that benefitted many generations. Aroha: I treat everyone I meet with kindness and friendship. Whakapono: Integrity, authenticity and truth = responsible lending. Rangatiratanga: Being financially literate and capable is part of being a good leader and positive role model. Mana Motuhake: The discovery journey of buying a home opens minds and positively influences change within. Whenua Ora: Healthy land healthy people. Optimal guardianship values. Based in the Waikato region, Susan speaks Māori and English and can assist her clients with advice around lending and KiwiSaver. A Registered Financial Adviser (FSP590328). A copy of my Disclosure Statement is available on request and free of charge.